This is a favorite recipe for Linzertorte. The real thing has a cake-like rather then a pastry-like texture. Pulse hazelnuts and sugar in a food processor until well ground, but not powdery. Add the flour, spices, cocoa powder, and baking powder and pulse again to mix. Add the butter; pulse again to mix in but without letting the dough become pasty. Add the egg and yolk and pulse until the dough clings together. Invert the dough to a floured work surface and carefully remove the blade. Divide the dough in half. Using a floured hand, evenly press half the dough into the prepared pan, then spread with the preserves to within 1/2-inch of the edge. With the remaining dough, pipe a diagonal lattice over the preserves. Or divide the dough into 10 pieces and gently roll into thick strands instead of piping. Sprinkle with the hazelnuts. Bake the Linzertorte until it is firm and lightly golden, about 40 minutes. Cool in the pan on a rack. Invert to a cardboard, remove pan and paper, and replace with a platter. Invert again, replacing any hazelnuts which might have fallen off. Dust lightly with confectioners’ sugar immediately before serving. 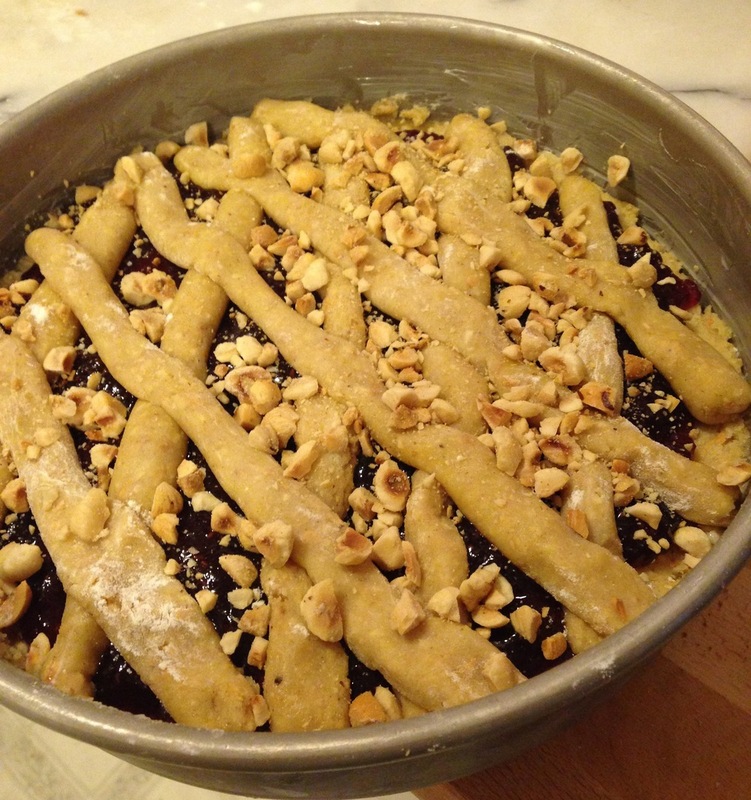 WEISSE LINZERTORTE: Substitute blanched almonds for the hazelnuts. Omit cinnamon and cocoa; add 2 teaspoons each grated lemon zest and vanilla with the egg and yolk.